No castors fitted to a piano are for transportation purposes. 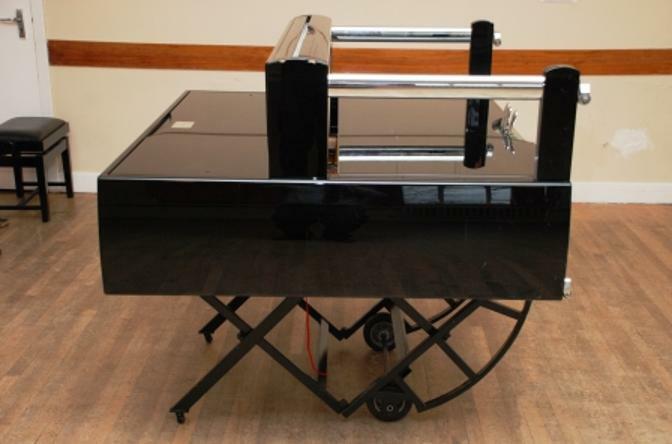 For moving over uneven surfaces, raised door treads, external paths etc an upright piano MUST be placed on a professional piano moving trolley designed for the purpose. See further down this page. 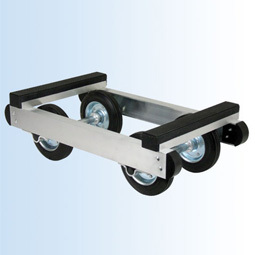 The photo above is of a set of Rear Toe Safety Castors. 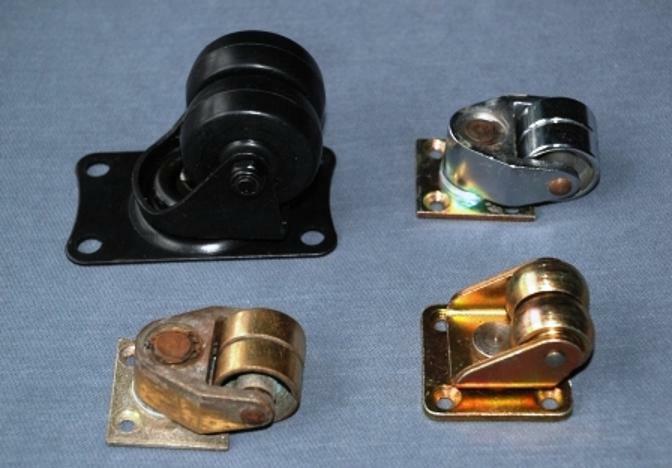 Any piano that's regularly moved within a room should be fitted either with these or with Cradle Bracket Castors shown below, depending on the case style of the piano . This page deals with upright piano safety. For grand pianos in schools and recital venues a device called an A-frame can be fitted, which links the three legs. I will be happy to advise. The newly-delivered piano presented two problems. 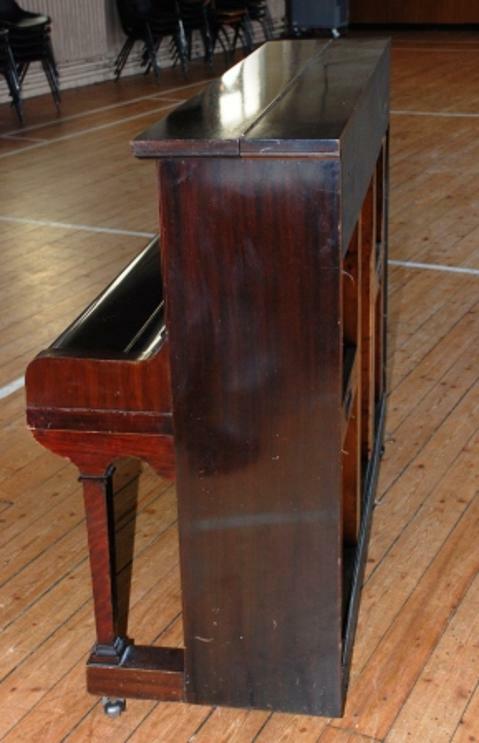 The hall is used by various community groups, and it's necessary to move the piano around. 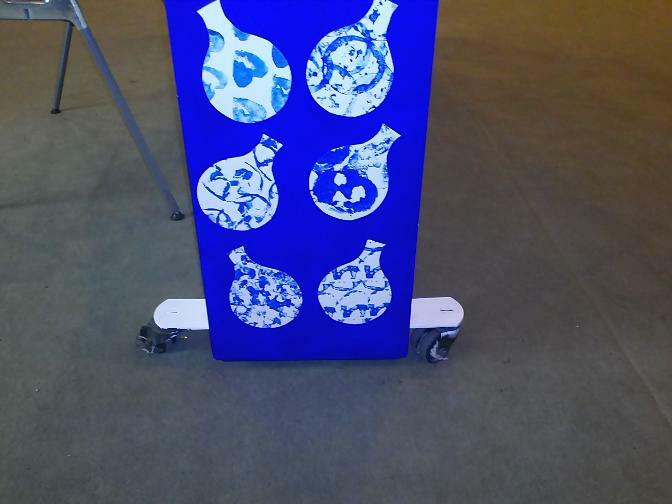 It came with its original iron castors, one of which can be see in the photo above, and close-up below. Upright pianos are top-heavy and can easily be toppled if pushed from the top. Health and safety regulations and the 'duty of care' mean that organisations need to be alert to such hazards. 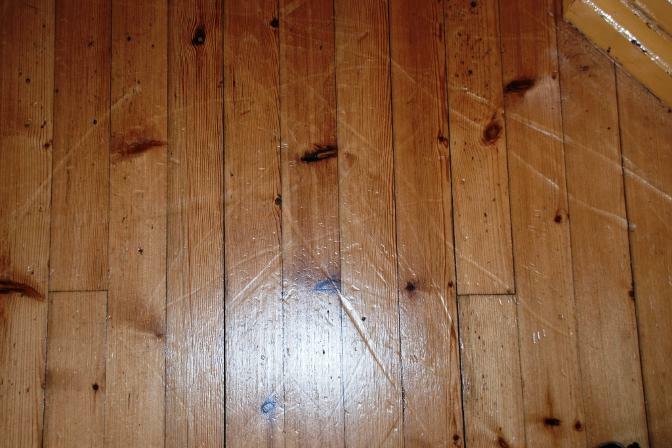 The other factor was that the old iron castors would ruin a good quality hardwood gymnasium-type floor. 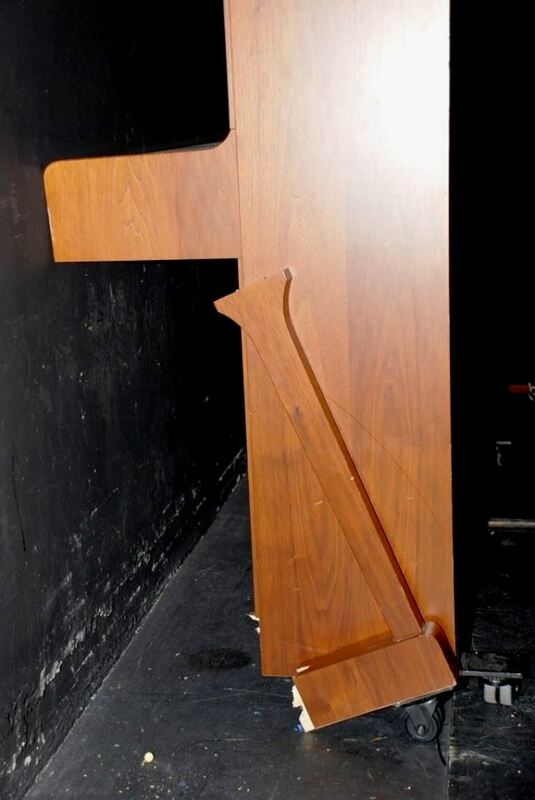 The tilter is held upright and positioned against the back of the piano, with its two protruding feet under the base of the piano. For safety, it should then be strapped to the piano. Note the red straps in the photo. Using the bar of the Tilter, visible just above the top of the piano in the photo above, the piano is gently pulled backwards, towards the operator. It tilts on the curved parts of the frame and can be carefully lowered to rest on the frame about eighteen inches off the floor. The old castors are then removed and the new Rear Toe castors fitted. Sometimes a bit of additional woodwork is necessary, depending on the design of the piano's base. 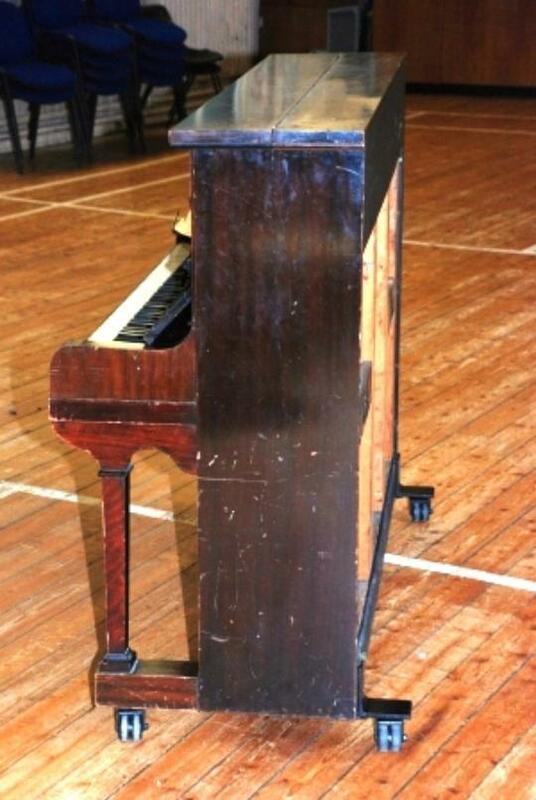 The photo below shows the piano after more than a year of regular use. The floor in the hall is entirely unmarked by the piano being regularly rolled across it (but there are a few more blemishes on the piano!). 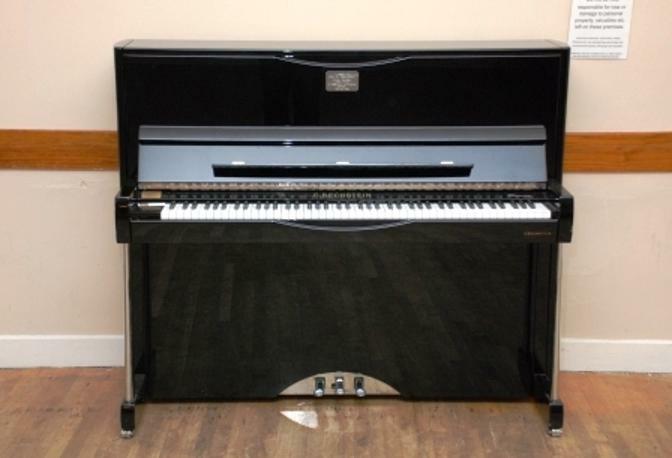 The move of Greenock's Arts Guild Theatre to its splendid new Beacon Arts Centre waterfront location means that the three high-quality upright pianos are more often re-positioned, in rooms having various uses. Rear Toe safety castors therefore had to be fitted, and the photos below supplement the information above. The Bechstein piano is used for music exams and is shown in its former location in a room where it remained against the wall. But in the new venue this has changed. 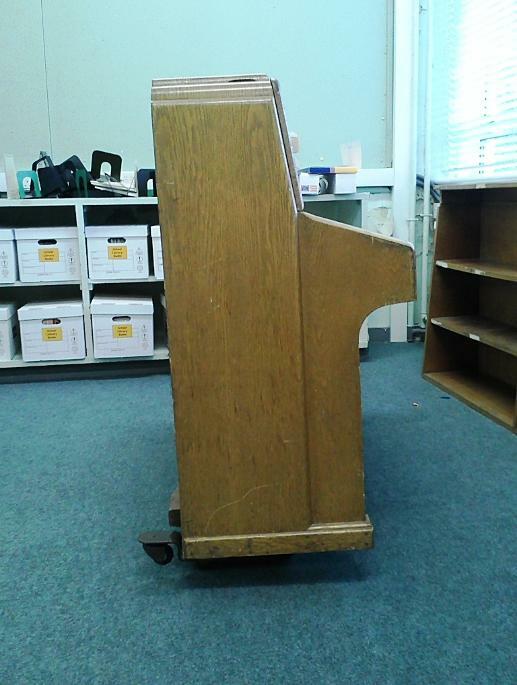 Without Rear Toe castors, an over-eager volunteer might quite easily topple the piano by pushing it at the top. 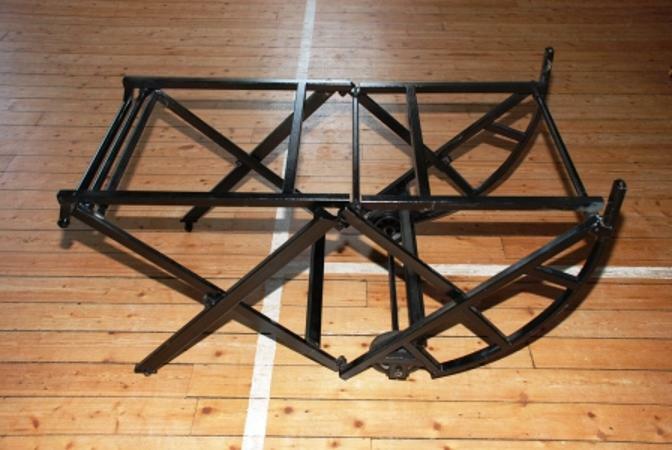 This is the Piano Tilter in its folded state for transportation. You need a car with a spacious boot! And assembled. 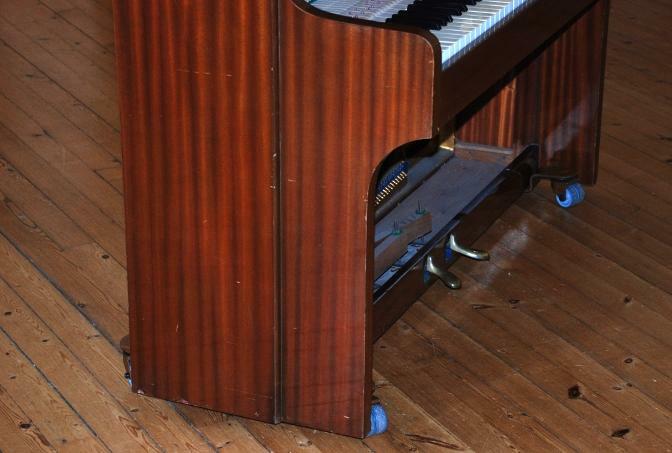 Note the protruding toes which fit underneath the base of the piano. As with the older piano earlier on this page,the tilter is raised upright and brought up against the back of the piano, with its protruding feet positioned carefully under the piano's base. 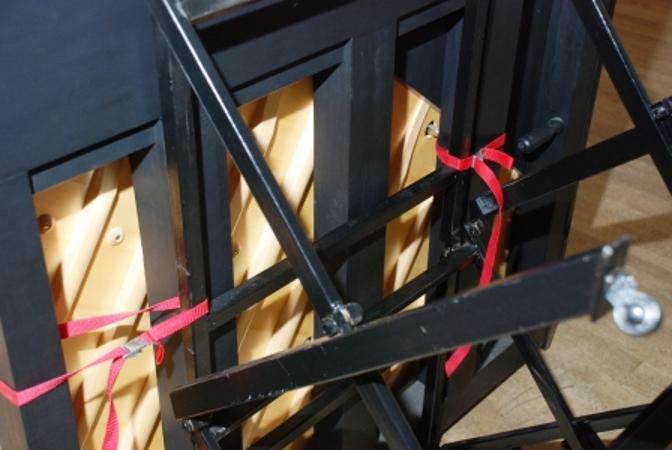 It's important to strap the piano to the tilter so that it stays in place when it's brought upright again. The placing of the straps depends on the construction of the piano. The backposts are not symmetrically placed in this piano. My preferred way now is to use a long strap around the centre of the piano longitudinally. The piano can now be carefully lowered on the tilter to lie horizontal, allowing access to the base for work on the castors. 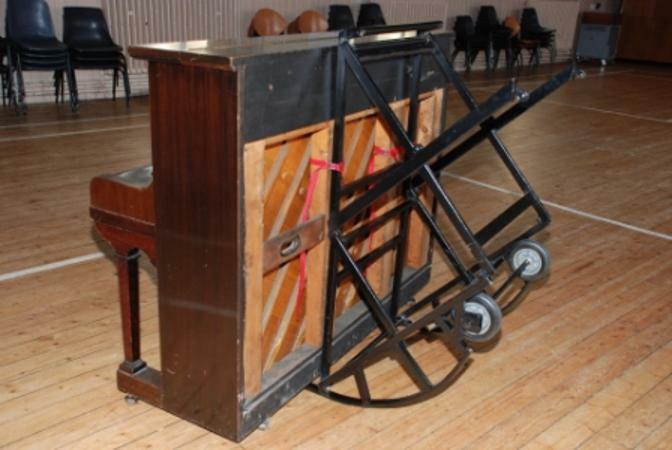 On its two large and two small wheels, seen in the photo above, the tilter with the piano on it can carefully be moved around if needed. 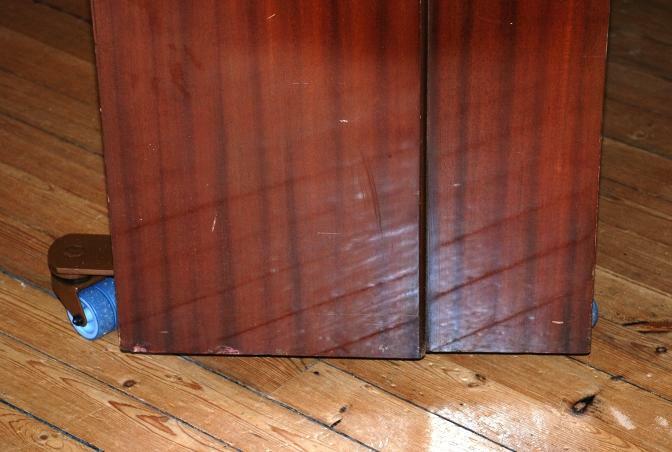 The photo below shows the feet of the tilter against the piano's baseboard. The basic quality castors originally fitted to this piano made it extremely difficult to move at all, quite apart from the risk of toppling. 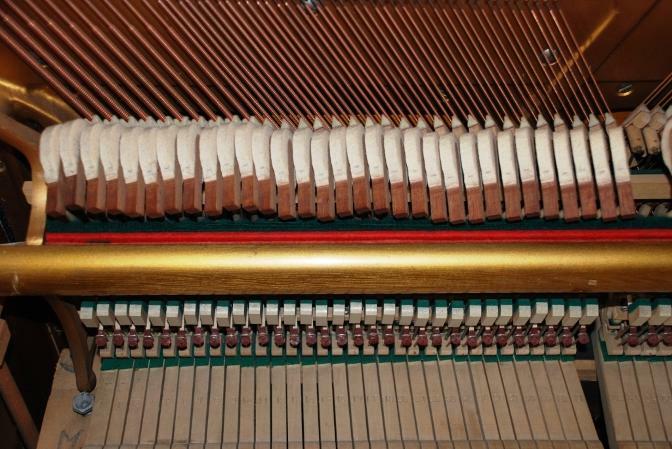 A complicating factor is the tendency for modern pianos, if they have toe-blocks at all, to have ones that are much narrower than those found on older pianos. Compare the photo above, with the expanse of hardwood found in the toe-block of the older piano shown earlier on this page. This means that it is sometimes necessary to drill new holes in the sole plate of the front castors, as here. The sole plate protrudes a little either side of the toe-block. 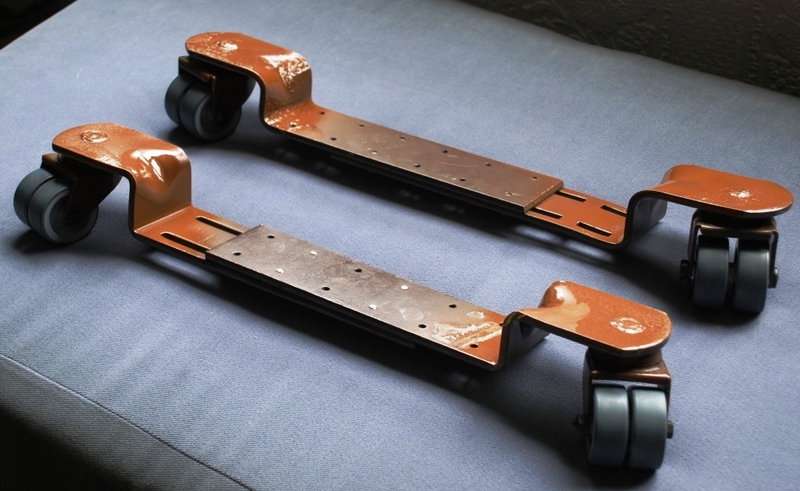 As it is, the size of the sole plate of these castors was already reduced by the suppliers some years ago, but it may be that a further cut-down will happen in the future. 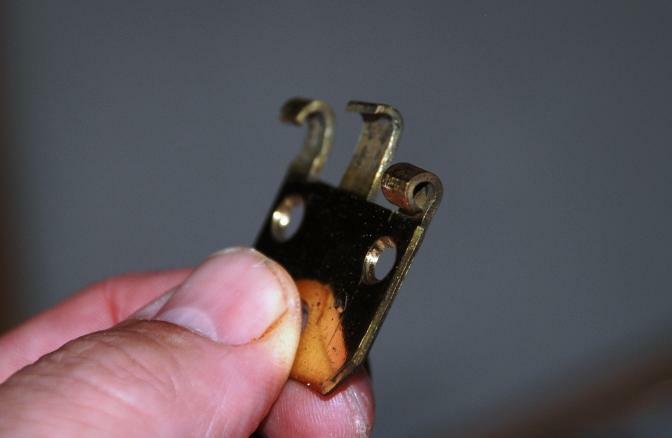 (For pianos which don't have toe-blocks at all, Cradle Bracket Castors, shown at the top of this page, are used. See also below). The Rear Toe castors for the back of the piano are welded to very solid brackets that are screwed to both the base and the back of the piano. 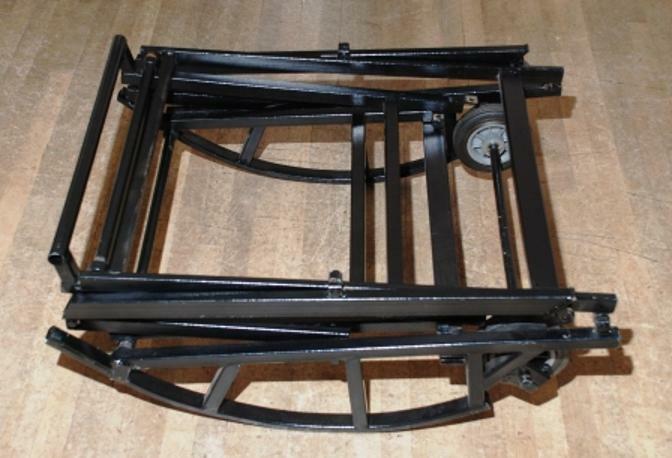 With all castors fitted to the base, the piano can be carefully brought upright again, and the backplate of each rear toe castor bracket screwed to the piano back, to complete the job. 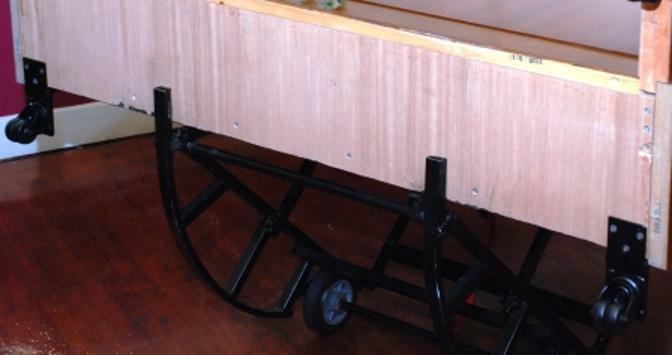 The piano can now be wheeled around the room safety without the risk of toppling backwards. No castors fitted to a piano are for transportation purposes. 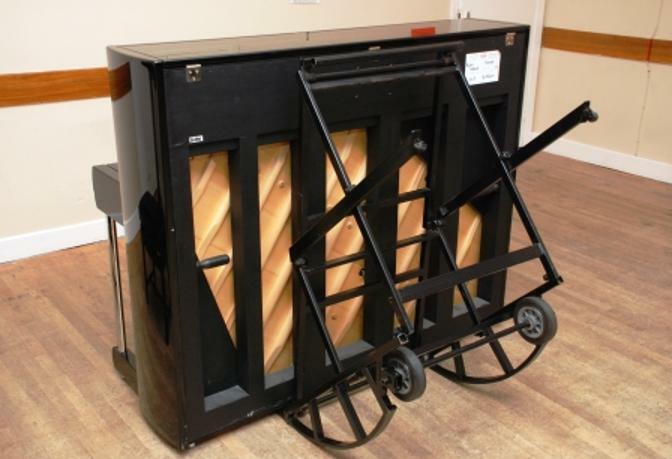 For moving over uneven surfaces, raised door treads, external paths etc an upright piano MUST be placed on a professional piano moving trolley designed for the purpose. We make no apology for repeating this important advice. Once you have a set of rear toe castors fitted, the piano moves easily. It can be tempting to move it from room to room, over raised door treads, even on outside paths, using its excellent new 'wheels'. But they are not meant for this. 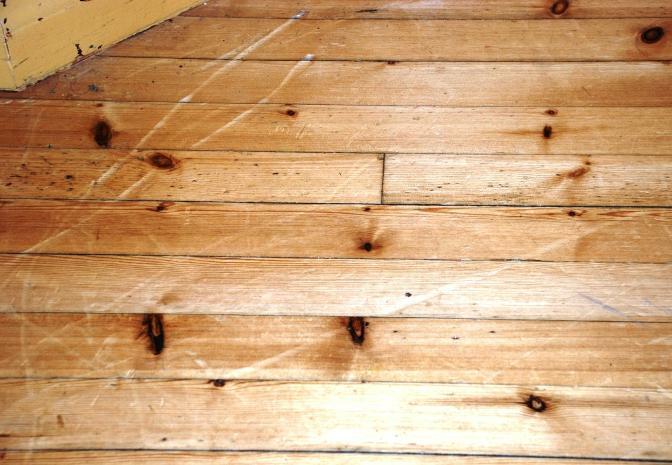 Taking a run at a raised door tread, for example, can put enormous sudden strains on a piano. It's like the difference between resting a hammer on the top of your skull, and bringing a hammer down smartly onto the top of your skull from six inches above. One is safe, the other may kill. Here's what happened to an expensive European (Bechstein Zimmerman) upright piano when it was pushed at speed over a shallow, bevelled raised door tread. This was the second, and worse, damage in this way to this piano - the toe block on the other side was also damaged previously. 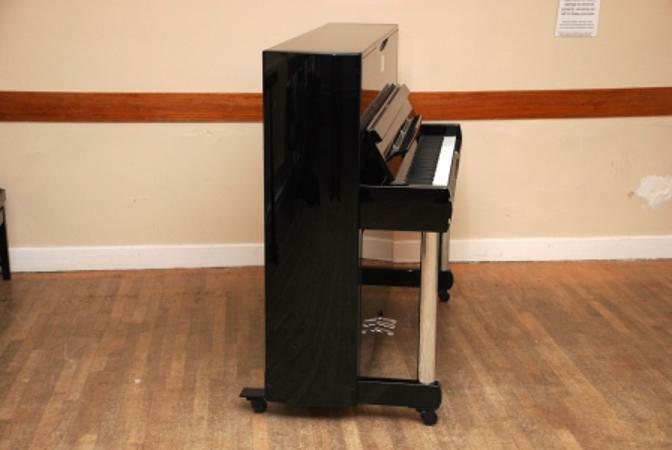 Image courtesy of Phoenix Supplies Online who supply this and other piano moving equipment. Many smaller modern pianos come without castors and sometimes an owner would like them fitted, for occasional moving in the home. 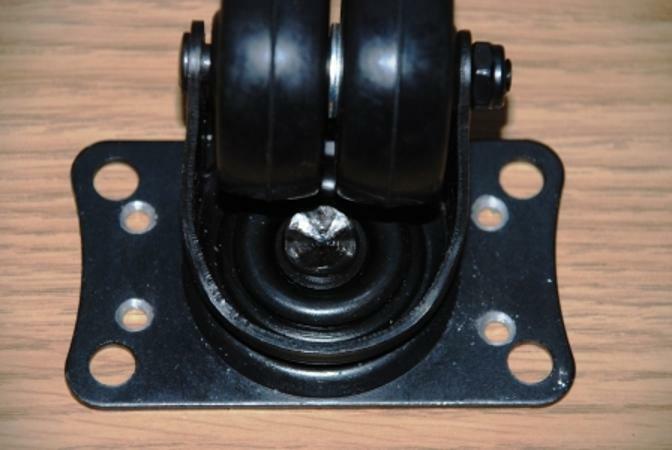 Rear Toe safety castor sets are not generally needed for this, and several options are available. Naturally, great care should be exercised in moving, always remembering that the piano is a) very heavy and b) easily toppled. 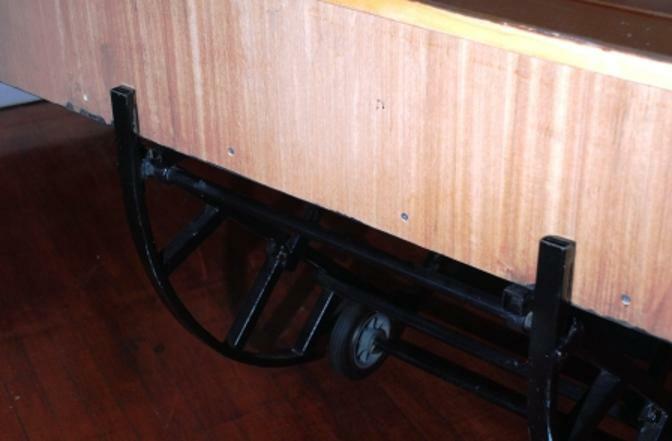 A piano trolley may be best, instead of fitting castors Consider this cautionary tale. So far, we've shown examples of fitting Rear Toe castor sets. 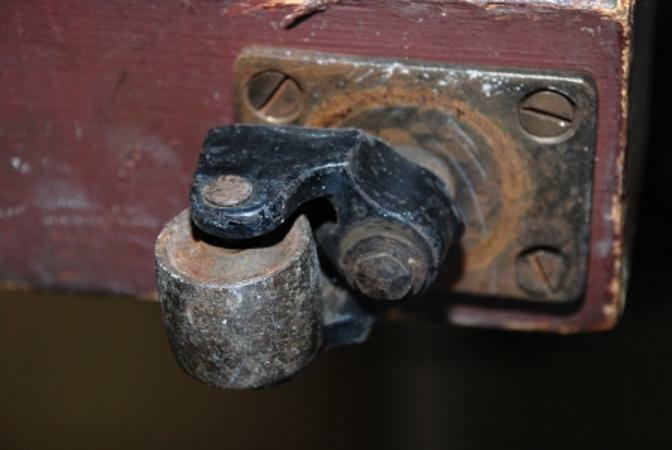 The other type of safety castor set is the Cradle Bracket type. 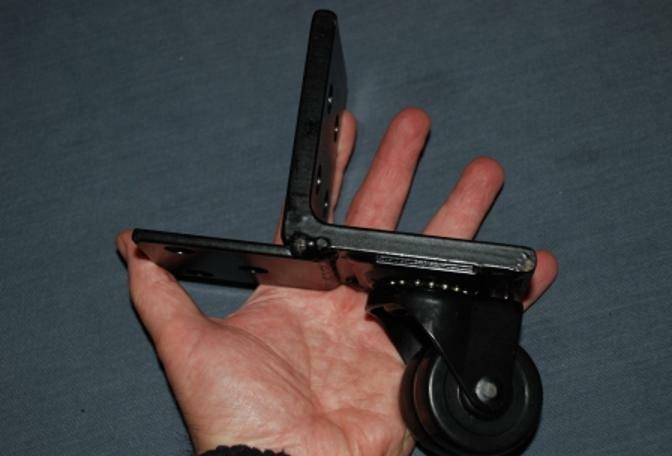 The aim is the same - to have castors that stick out at the back of the piano to give stability. 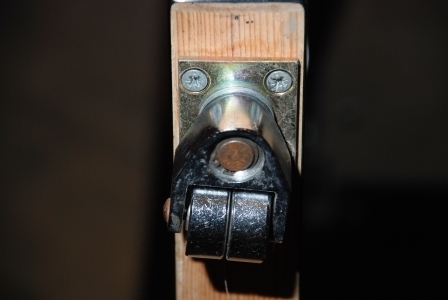 But the Cradle Bracket type are intended for pianos without front legs and toes. 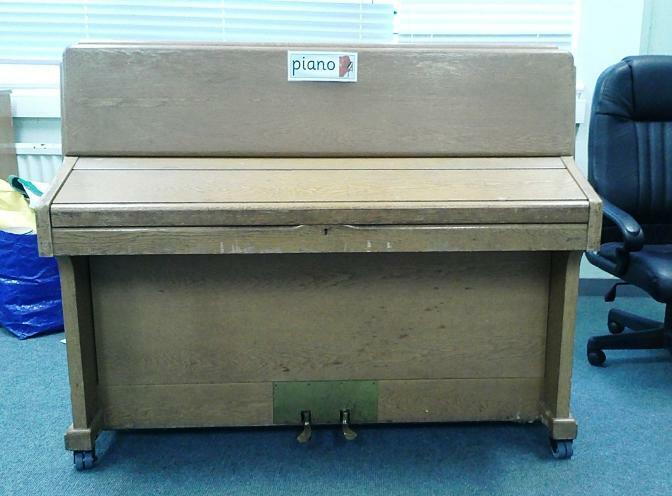 These pianos tend to be smaller and lighter, with case styles popular from the 1960s to the 1980s. 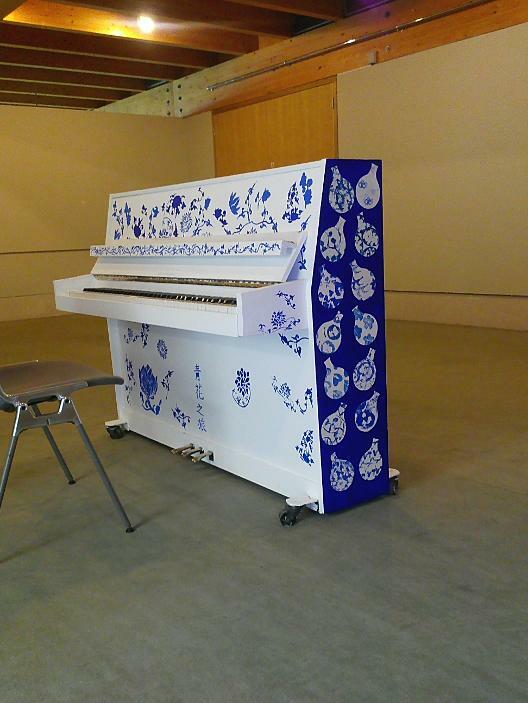 Here is a small 1970s piano, decorated for a project. 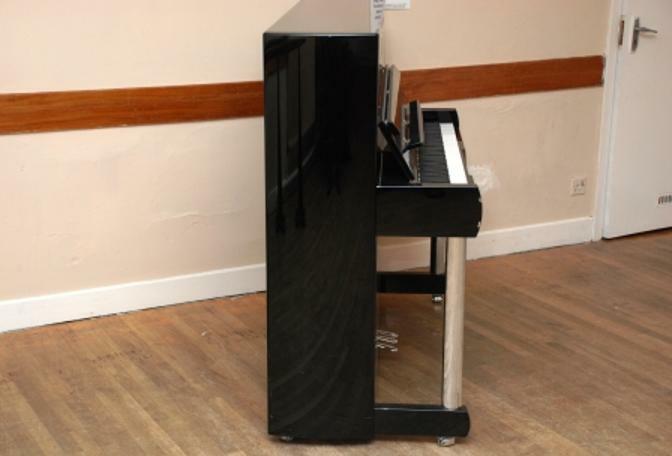 It's of the style that's better fitted with Cradle Bracket Castors and you can clearly see them in place on this piano. 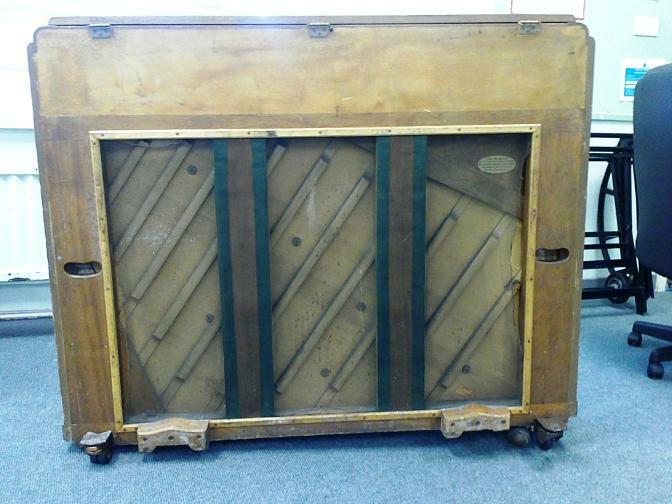 The examples we've looked at so far, show the correct type of safety castor being fitted to upright pianos of the two case styles - with, or without, front legs and toes. But in peripatetic pianistical peregrinations, one comes across all sorts of mis-matches and mash-ups. Brand new pianos in each of two local schools came with these fitted. And the Principal Teachers of Music in both schools made exactly the same two points. One, that the pianos rock back and forth when played and are disconcertingly unsteady, and two, that they don't move easily and are tending to mark the floor. It doesn't show well in the picture (I will try and get better ones) but there is nothing under the front legs/toes. A cradle bracket at each end is all that supports the piano, and for this traditional-styled and heavier piano, that simply isn't adequate. These need to be replaced with a Rear Toe set as shown earlier on this page. 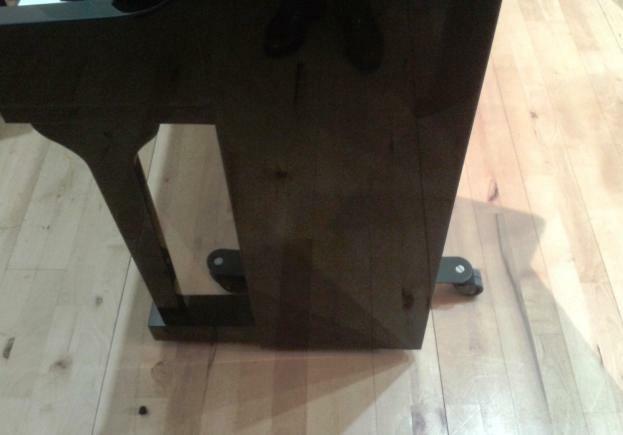 I don't know why retailers fit Cradle Brackets to this style of piano. It's obviously sitting at an odd angle and doesn't look well supported. Behind the piano the original factory-made wooden rear toe blocks could be seen, but there were no castors in them. This poor piano had been fitted with two sets of castors, neither appropriate (the round ones not even piano castors) and both sets damaged. No wonder it was hard to move! 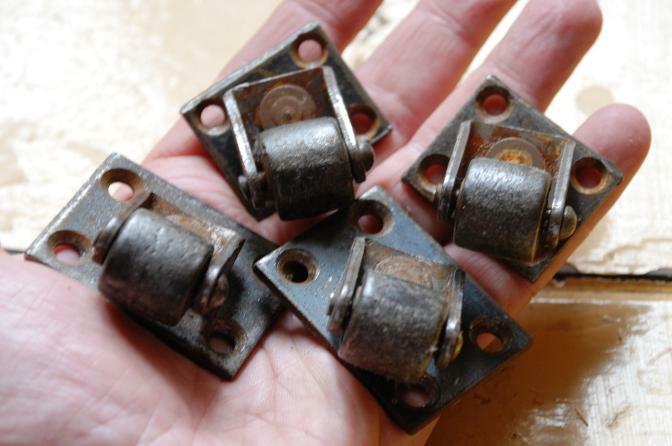 Whatever damage happened to the original castors, all that needed doing was to fit a set of four good quality twin-wheel swivel castors. It was not necessary to use a Rear Toe set, as the piano already had its own factory-built rear toe-blocks. With its nice new wheels of the correct type, the piano is level, rock-steady, and easy to move around. We're not in the realms of alarmist fantasy in talking about a piano falling over. Not long ago I was consulted about a 1950s Bentley piano in a hall used for various community purposes, including Associated Board music exams. 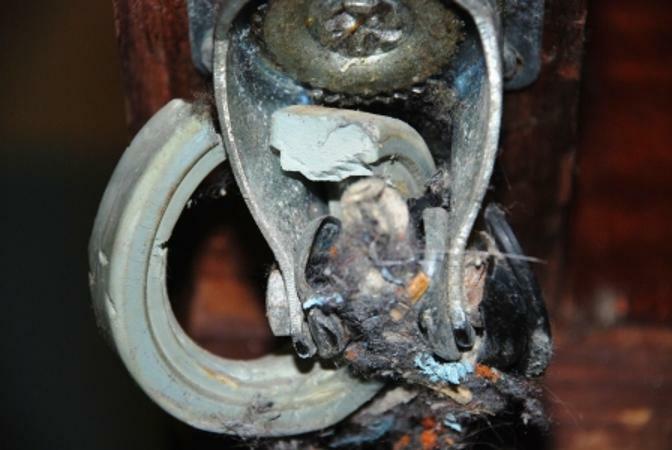 Here is half of the hinge. How did it get like this? And then, with front panel off, it could be seen that the left action bracket had somehow jumped out of its little cup. All this was consistent with the idea that the piano might have fallen over, and indeed it turned out that exactly that had happened. 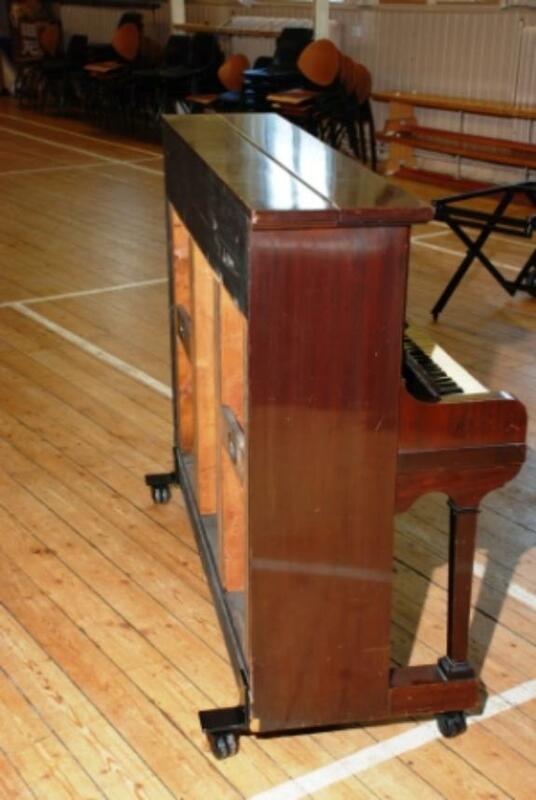 Fortunately no-one was injured when it fell, and the damage to the piano was fixed relatively easily. But had a child been in the way, things could have been nasty. 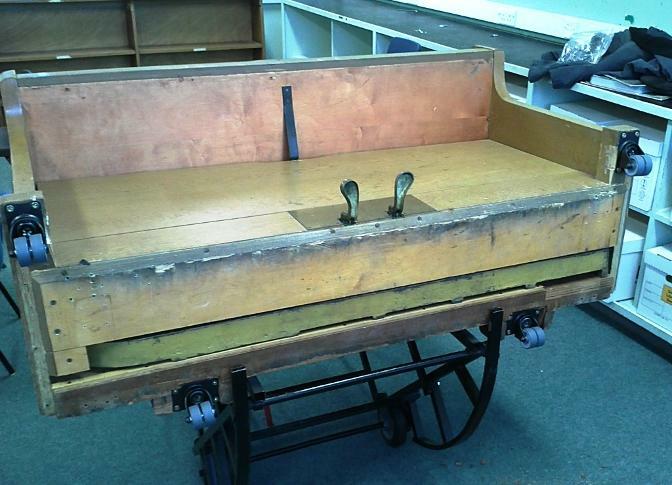 A set of cradle bracket castors was fitted and the piano is now easy to move, and will not further mark the floor. The case design of this piano made it a little tricky to fit the castor brackets optimally, but good functioning was achieved. Within six months of the accident to the piano above, I heard of another community hall piano in Inverclyde falling over. 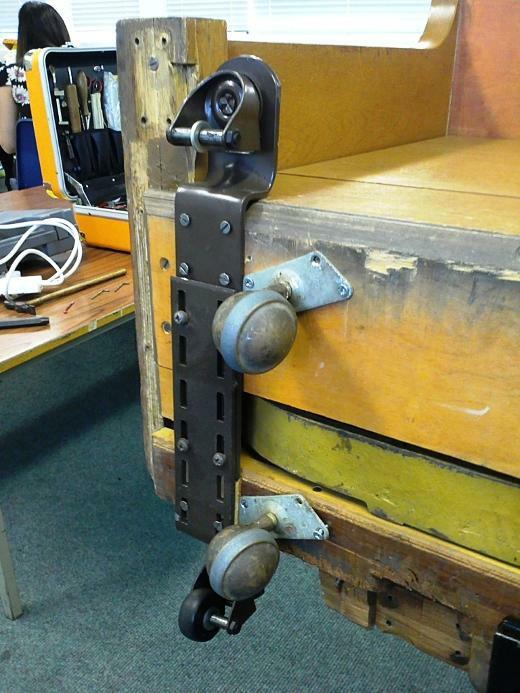 It's an older piano and seldom moved, so it didn't seem worth the expense of fitting Rear Toe castors. After discussion, it was decided that a short chain at the top of the piano securing it to the wall, would meet the 'Duty of Care'. However, It seems that someone wanted to move the piano, and simply unhooked the securing chain. The piano duly fell over while being wheeled across the floor. Two such instances happening in one area, Inverclyde, within a few months, shows that this isn't a theoretical hazard I'm making up to scare people. It's real, and it happens. Imagine if the piano was being used for a mothers and toddlers group, and an infant was in the way when it fell. Think of the legal liability as well as the possible human cost. 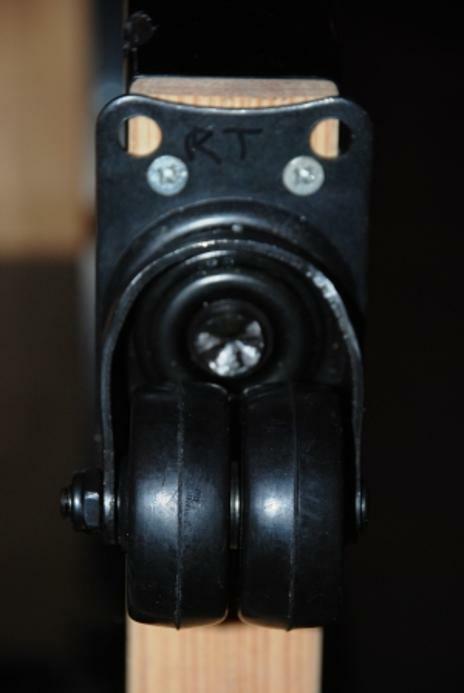 Close-up of a Rear Toe castor showing the rugged construction and the ball-race which makes the wheels rotate smoothly to change direction.